When I visit botanical gardens I always appreciate a “what’s in bloom” display. 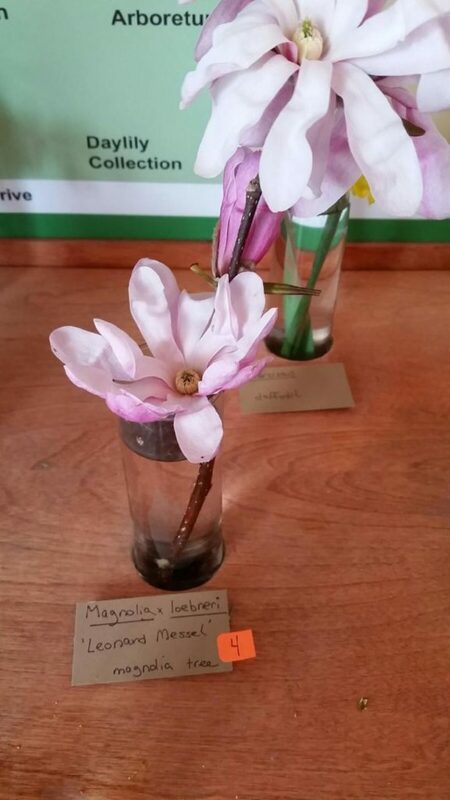 This is an educational display that can be as simple as a vase with cuttings from the garden and the plant names. I like to see if I know the plants before I read the labels! Rotary Botanical Gardens has one of the best cutting displays of any garden I’ve ever seen. 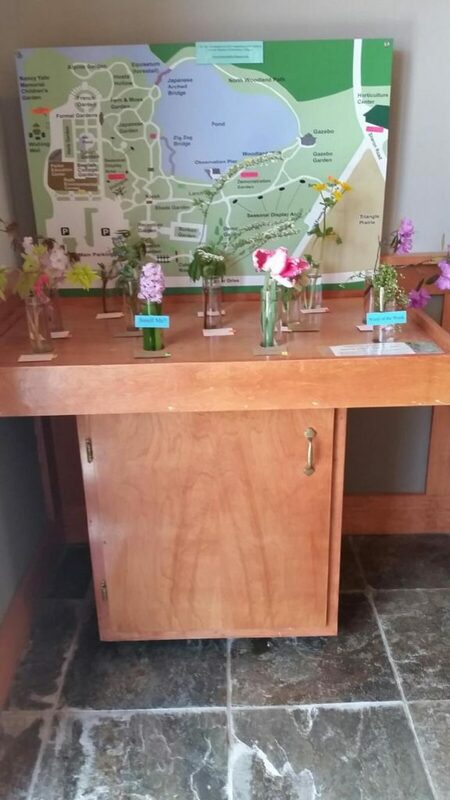 Our display table, located at the entrance of the Parker Center, holds a dozen glass vases. A large garden map is included to indicate where the specimens are from. Display table showing early spring plants. The display is changed twice a week. I have the fun task of creating this display. It allows me to really look at the gardens and consider which are the coolest plants growing that week. 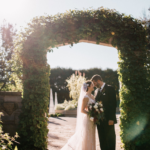 How often does one get to pick the flowers at a botanical garden? 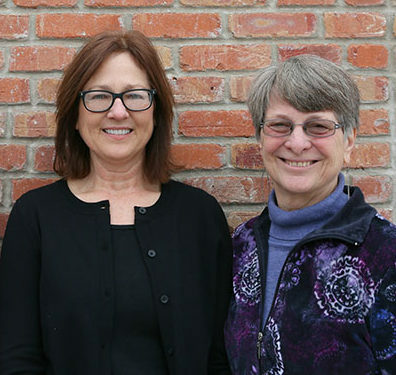 Cuttings are placed in water and a handwritten sign is created that includes the botanical name, variety, and common name. The sign is assigned a number which corresponds to the same number on the map, indicating its location in the garden. Small hand-written cards, held down with adhesive putty, identifies plants. 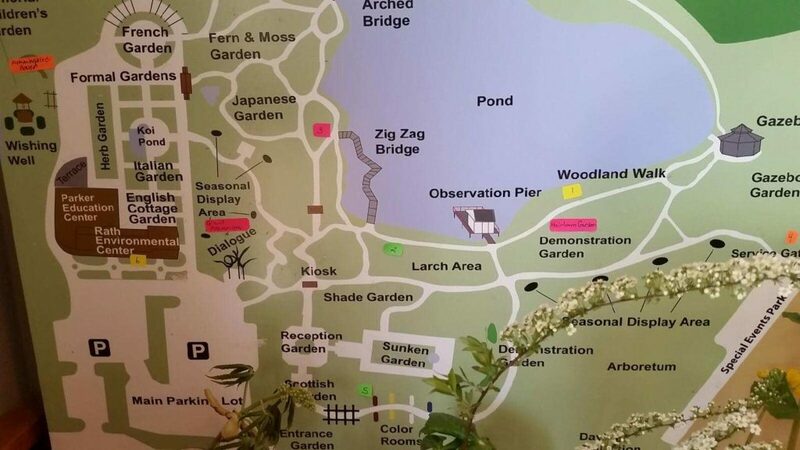 Garden map has numbers indicating where plants are found. For smaller cuttings, especially in early spring, test tubes are very useful. And a petri plate can hold moss, seeds, leaves and other small plant structures. 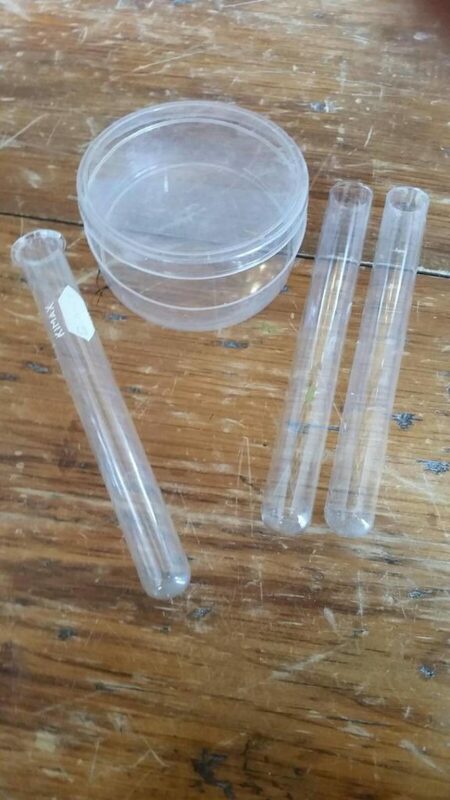 Always good to have a supply of petri plates and test tubes on hand! 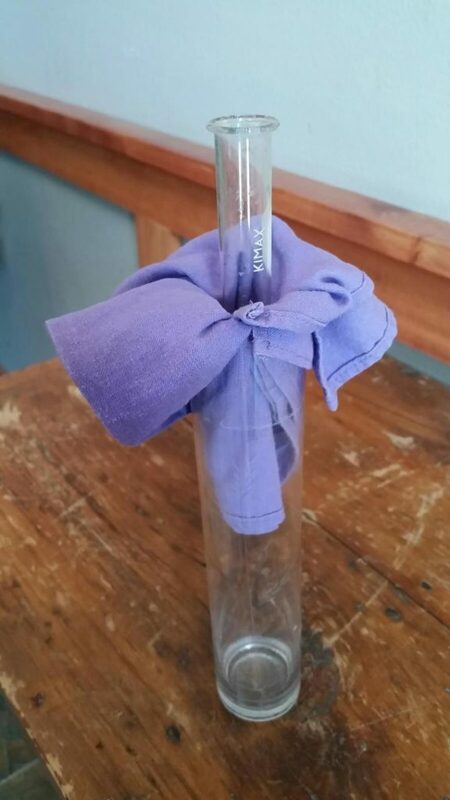 A test tube cradled by a dinner napkin can display small early spring flowers. I also like to reserve one of the vases to highlight a weed (I call this the “Weed of the Week”). 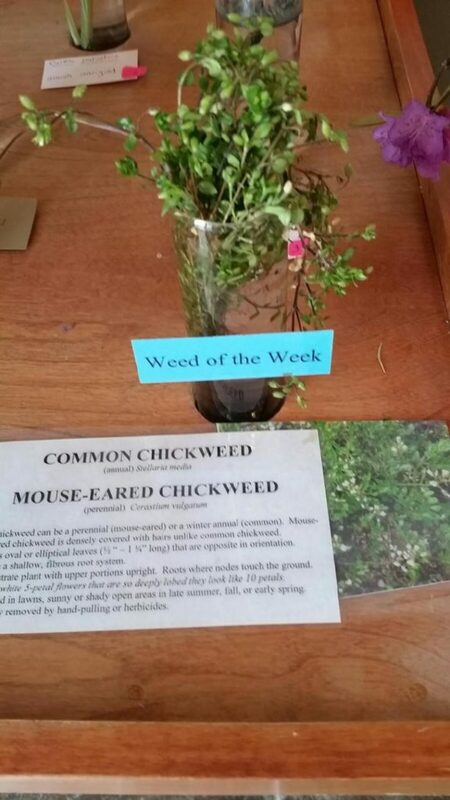 Unfortunately, there are always plenty of weeds to choose from! I keep a folder of laminated weed information signs that I created several years ago. 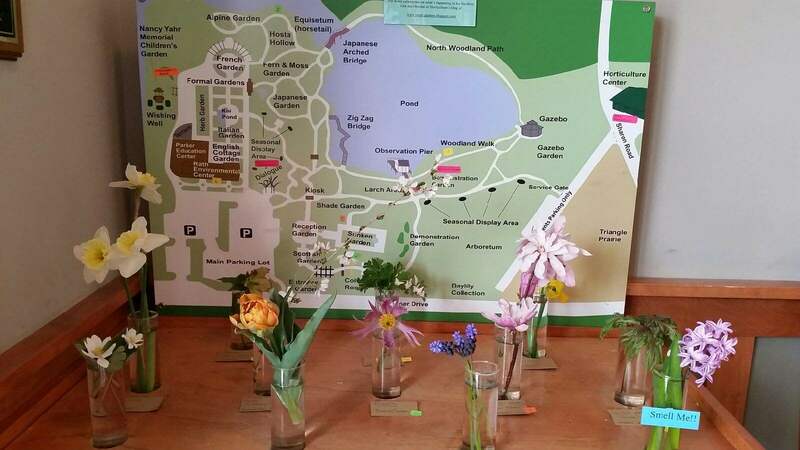 This is an excellent way to educate visitors about how to control invasive plants. Information card includes how to identify and control the weed. I also created small laminated signs that give further information about the plant (I stick these on with the adhesive putty). They might say “Smell Me!” (for lovely scented flowers) or “Touch Me!” (for plants that have neat textures). I once labelled a foul-smelling flower with “Don’t Smell Me!” and had great fun watching visitors lean over to take a whiff (they couldn’t resist!) then wrinkle their nose and say, “Ewwwwww”. There was definitely some truth in advertising there. And best of all, the display table was being used to educate the public about horticulture!